Now you can book your own personal chauffeur for an airport pick up and drop off with SaudiGulf’s exclusive chauffeur service. Enjoy your trip with a choice of Premium, Standard, and Family services from the Airport to your desired destination or vice versa. SaudiGulf Airlines will make sure you have a comfortable journey and complete peace of mind. The price is for a one way trip on either the outbound or return sector of your journey and covers a 75 kilometer radius from your starting point. SaudiGulf’s Premium Chauffeur services will take you from your home to the airport, or from the airport to your home or final destination, in either a BMW 5 series, Audi A6 or equivalent. With SaudiGulf’s Premium Chauffeur services, you are allowed a maximum of 4 passengers, with 2-3 bags. All vehicles are equipped with Internet connectivity. SaudiGulf’s Standard Chauffeur services will take you from your home to the airport, or from the airport to your home or final destination, in either a Camry Sonata, Mazda 6 or equivalent. 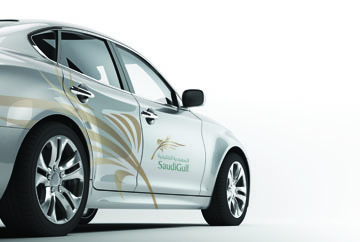 With SaudiGulf’s Standard Chauffeur services, you are allowed a maximum of 4 passengers, with 2-3 bags. All vehicles are equipped withInternet connectivity. SaudiGulf’s Family Chauffeur services will take you from your home to the airport, or from the airport to your home or final destination, in either a Suburban, Tahoe, or equivalent. With SaudiGulf’s Family Chauffeur services, you are allowed a maximum of 5 passengers, with 3-4 bags. How to book a chauffeur service? 1. If you have an existing flight, you need to visit the Manage Your Booking page or call our Call Center Agent on 9200 22022. 2. If you do not have a booking, you need to request a Chauffeur while booking your flight via Booking a flight page, or you may call our Call Center Agent on 9200 22022 to book your chauffeur while booking your flight. 3. The Family Chauffeur service is only available for booking through our Call Centre on 9200 22022. 4. Chauffeur Services must be booked at least 24 hours prior to the scheduled time of departure of the flight. Where do I find the Chauffeur Driver? a. Passenger will be contacted whenever the chauffeur arrives at the desired destination. a. Passenger needs to be at the meeting point and he/she will be able to see our staff holding a placard with the passenger's name. *Note: Below destinations are available for bookings through Call Centre only. For more information on the Terms and Conditions please click here.